Are you stuck deep in the pits of blogging darkness not knowing how to get traffic to your blog? Or maybe worse - riding a crazy traffic roller coaster?! I feel your pain! Not too long ago, I was sitting at around 15,000-17,000 page views per month (sometimes dipping lower than that), despite publishing a TON of content and working 30-40 hours each week on my blog. I didn’t know what the heck was going on! I seriously wanted to throw in the towel. I was spending sooooo much time on my blog that, in addition to being a stay-at-home-mom, there was no way I could scale that up and produce more income. It seemed no matter what I did, my blog traffic increased at a snail’s pace. I was tired of seeing others hit milestones of 50,000, 150,000, and even 300,000 page views all the while I wasn't sure I'd make it to the 20,000 mark each month. All that hard work, and my page views were going down!! You can see I had that one spike in early March, but it was short-lived, and I was back down in the dumps. I had ended January with 25,100 monthly page views and ended February with 35,722 thanks to a good selection of Valentine’s Day related posts on my blog. I just assumed things would trend up as long as I kept working hard the same way I had been. I finally realized I needed to take a step back and figure out exactly how other people were getting tons of traffic when all I could get consistently was a few hundred page views per day. After studying countless of other bloggers, I realized I was going about this all wrong. I dreamt of becoming a full time blogger. I committed right then and there to drop my bad (i.e. ineffective) blogging habits immediately and replace them with effective ones. This guide is the story of my journey in figuring out just what I was doing wrong and what I could change to improve my blog traffic. I dedicated myself to learning one new thing per day and making one change to my blog each day that would improve my traffic. It was 2 hours here, 3 hours there kind of thing. Slowly but surely, I started to see improvements, and it’s been a steady climb ever since. It was a long gradual steady climb with a few motivating spikes in traffic along the way (and one dip – due to me not having any Thanksgiving content at a time when people aren’t otherwise on their computers!) That’s what I love about blogging. It rewards consistent hard smart work – little by little you can get there! I tested out many different traffic strategies over this time frame, and I found some worked really well while others were a complete waste of time. Once I reached 300,000 page views, I was able to exceed the income goal I set for myself for THIS year….I decided at that point I would see what I could do about teaching others to do what I have done. I put my top 21 traffic generation tips & theories and a list of what NOT to do in an 100+ page guide so you can learn what has worked and not worked for me. If you follow along, you'll be able to get traffic to your blog without having to learn it the hard way yourself! I poured all my best tips, from what I do just after publishing each post to how I share my content on lesser known platforms like Google+. To celebrate surpassing the 2,000 copies sold mark, Traffic Transformation will get another major overhaul this spring. I've learned a LOT since its original publish date in December 2015. The newly revised guide will reflect that knowledge. The last update saw the addition over 40% more content PLUS a 40-minute Google keyword research & optimization training video. The 2019 update will build on that! Not only are there 5 new traffic tips in the updated guide, there are MANY more examples. My goal is to not only TELL you what worked for me, but give you real examples from my blog - WhatMommyDoes.com - to show you how these ideas will help you. 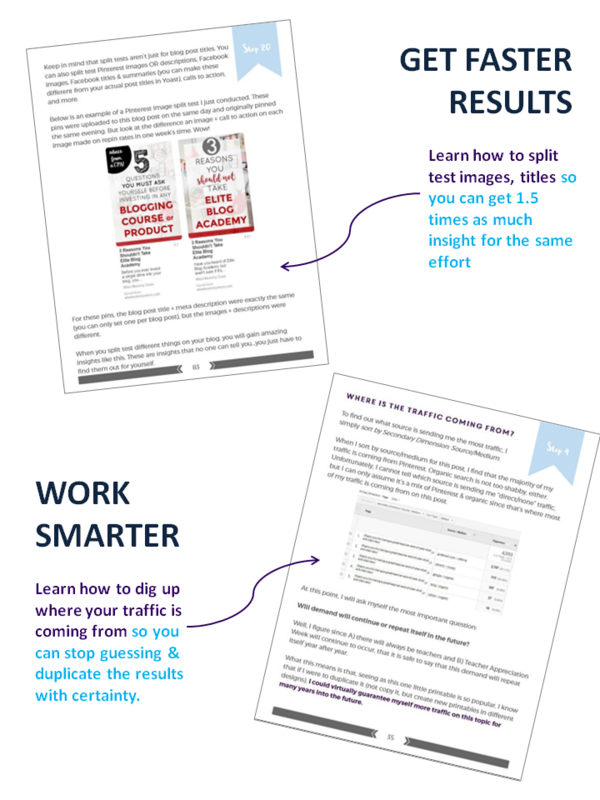 Traffic Transformation is PACKED with detailed guidance + even comes with homework & worksheets! Traffic Transformation contains A LOT of detailed instructions. I recommend you go all the way through it once before trying to implement anything. Then go through it a second time and takes notes. You will find that some steps are easy to implement and others require you to think out a strategy. How would you feel if, not too long from now, you no longer felt like traffic was a mystery? I finally feel that way. And that is my hope for YOU. The tips in Traffic Transformation are listed in the order I implemented them on my own blog. While you may not need to start at the very beginning if you've been blogging for a while, even experienced bloggers tell me that they find at least six to a dozen blog traffic tips to test on their blog. Many people read the guide again and again every time they need a traffic boost. There is a LOT packed into these strategies including VERY specific examples like these to improve your blog traffic! "My traffic was at a plateau for a while. I was blown away by your book. This book taught me more about traffic than any $200+ course. You not only share what worked for you, but also what didn’t work, which is awesome. I thought I knew everything there was to know about building traffic, but I didn’t. My biggest takeaways were importance of interlinking (game changer), displaying my popular posts, duplicating my success, and how to best utilize social media. I even improved my social media share buttons after reading your book. Your blog traffic ebook helped me more than double my traffic last year. No joke! Your ebook is the real deal, and has been one of the best purchases I’ve ever made for my business." 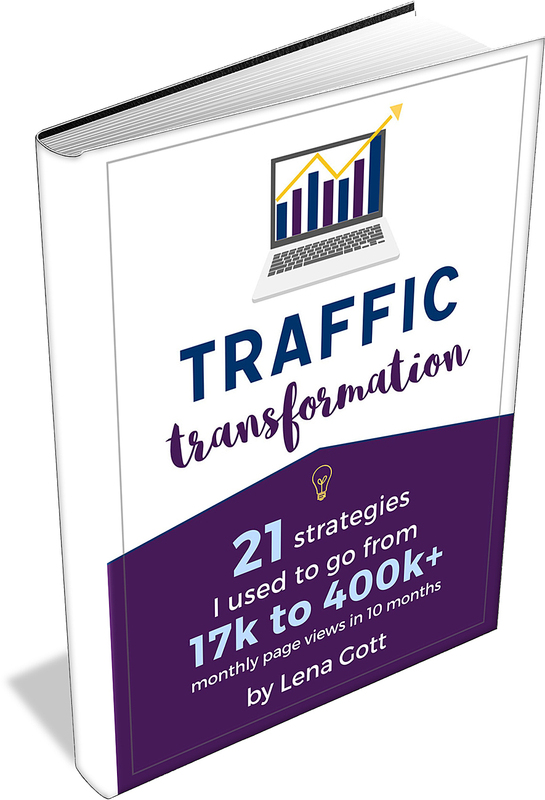 "Traffic Transformation is a comprehensive playbook for what's working right now to generate traffic to your blog. With Lena's easy-to-follow advice, I was able to break past 10,000 page views to over 70,000 in a just four months. It also doesn't hurt it's a fraction of the price other eBooks and courses. If you're struggling to grow your blog, I highly recommend Traffic Transformation." Traffic Transformation - New for 2017!